A group of plants called succulents that have either fleshy stems and/or leaves are often chosen as house plants for direct light conditions. Their ability to endure drought is reflected in the succulent stem/leaf condition where water is stored. These plants come from many plant families; most notably the cactus family. Others in this group, however, come from sub-tropical areas where light conditions are less extreme and moisture is more abundant. In this second group we find the Christmas, Thanksgiving, Easter and Orchid cacti. Some refer to this group as the jungle cacti because they are found as understory plants in tropical forests. Some succulents make good house plants because they generally do not require much care and can grow under the average conditions of the home in which we find higher temperatures and low humidity. Some varieties are slow growers and therefore, present fewer demands for care than most other house plants. If you have a southern window in your home that receives direct light and becomes fairly hot, then you might consider choosing a succulent for that spot. The cacti and succulents generally require at least 4 hours of bright, direct light each day. However, some including the jungle cacti prefer medium light intensities and should never be placed in direct light except during the winter. Overall, if you wish to move a plant which has been grown in indirect light to direct light, then this should be done gradually. The same is true if you move a plant outdoors. Even though it has been in a direct light location in the house, it will be damaged if moved directly to full sun. Moving plants to a position with filtered light such as under a tree or shade screen will prevent sunscald. This appears as a bleaching of the foliage resulting in a yellow-white color. In addition, plants receiving direct light benefit from turning periodically so that all sides are exposed. This is especially true of plants with heavy growth. 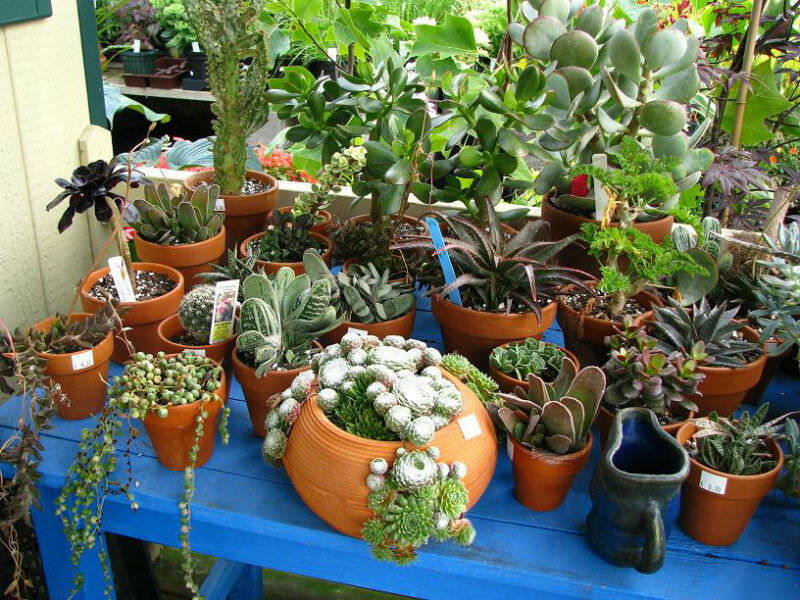 Most cacti and succulents tolerate the low humidities and warmth of the home. During the winter, it becomes difficult to regulate humidity because of heating. The only succulents which can be temperamental are the jungle cacti. These plants, including the Christmas and Thanksgiving cacti, require higher humidities and should be placed on a tray of moistened rocks. This condition will promote flowering and flower retention. Temperature in the home is generally adequate to maintain cacti and succulents all year round and this makes them particularly suitable as house plants. Some, however, do much better if presented with cool conditions during the winter. This is known as a rest period. Window sills and cool basements are good sites for these plants. The light should be as bright as possible. Overall, cacti and succulents should be watered more frequently during the period of greatest growth and this occurs between the months of March and October in the Midwest. The most frequent cause of problems with the cacti is due to overwatering. The moisture condition should be checked ever 2 to 3 weeks. This is simply done by sticking the index finger into the soil. Soil particles should not cling if conditions are dry. Also, you should become familiar with the weight of the pot at dryness and this can served as a gauge for watering. It is best to allow the pot to dry out thoroughly between waterings. Plants in full sun will naturally dry out more quickly than those in filtered light. In winter, water no more than once per month. This is a slow growth period. Overwatering at this time will result is root rot by fungal organisms. 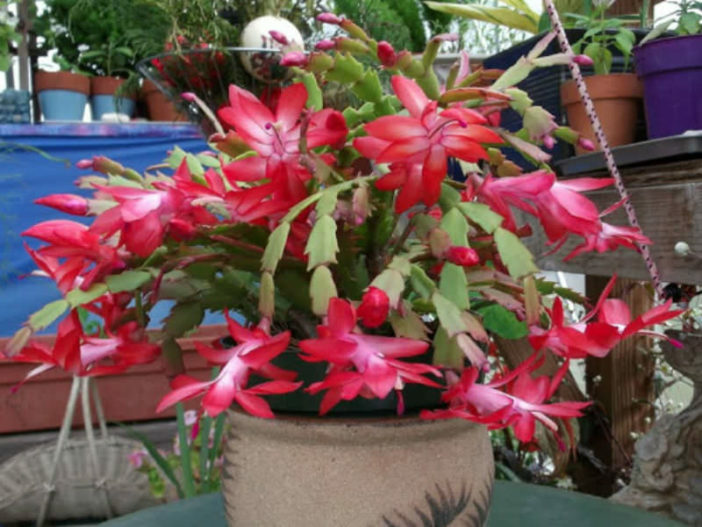 Jungle cacti should be kept evenly moist all year round, especially during the flowering period of late fall or early spring. When flowering has stopped, water should be withheld to allow the soil to dry before rewatering. The soil mix should match the moisture requirements of the plant. This is better than trying to match the frequency of watering the soil mix. It also dictates the drainage and regulates the nutrient supply. All cacti and succulents require good drainage and the type of soil should be coarser. An appropriate soil mix for most cacti would consist of two parts sand and one part soil mix. For tropical cacti like Christmas and Easter cacti, mix one part sand with one part soil mix and one part peat. The peat will hold more moisture than is required for these plants. Sand will create the proper drainage for all cacti and succulents and by varying its content, greater or lesser moisture will be held by the mix. Generally, succulents and cacti do not demand a great deal of fertilizer to grow. Amounts recommended for typical house plants should be cut back to one-quarter to one-half concentration typically recommended on the label. The time to fertilize is during the active growth phase which begins in March and ends in October. In winter, no fertilizer is necessary as this represents the dormant state where little obvious growth occurs. Most cacti and succulent prefer to be pot-bound. This condition leads to more frequent flowering in the case of jungle cacti. If plants become too pot-bound and the top growth is unbalanced, they should be repotted. The size of the pot should only be about 1 inch larger in diameter than the previous one. Tall plants should be repotted in a container which is at least one-half the size in diameter as the plant is tall. The time to repot is when growth begins in the spring. Potting during the dormant stage will set the plant back because a part of the root system may be lost during the process and it will be very slow to recover. Cacti and succulents are among the easiest to propagate because they have such a large storage system of water and nutrients and are thus, very well adapted to adverse growing conditions. Some cacti actually loose parts of their stems as an active way to self-propagate. These parts may lay dormant for over a year and become quite desiccated before new roots emerge as a response to wetter conditions. There are three forms of vegetative propagation where some part of the mother plant is removed and used to grow the new plant. This is by offset division, stem cuttings and leaf cuttings. Although more time consuming, some cacti and succulents can be started from seed. Generally, this is not worth the trouble because it may take between 2 to 5 years to establish the new plant with such slow growth rates as characterized by these plants. The most popular way to propagate cacti and succulents is by division. Certain cacti will produce offsets which are small bulb-like protrusions that stick out from the mother plant. These can simply be pinched off and potted after a couple days of drying at room temperature to callus over the wound. The soil should be kept damp for about 4 weeks. Check for roots by tugging at the plant. If the pot lifts with the plant, then you can be assured that it has rooted. The other way many cacti and succulents can be propagated is by taking cuttings of stems and leaves. Plants can be cut just above a node with a sharp, clean knife. The excised part should be air dried for 2 days then potted by burying a slight portion of the plant part in a sandy/peat potting mix. In a similar way, leaf portions from some plants like Sansevieria can be cut and potted. Leaf segments for this plants should be about 2 inches long. A segment should be potted in such a way that the basal portion that was closest to the root system of the mother plant is buried in the soil mix. Roots will not form from segments that are upside-down. Although it may take a number of years, most small cacti and succulents will eventually flower. Larger cacti are not frequent flower producers. Some produce a tremendous number of blossoms over a short period and some only produce one or two. Additionally, some plants only produce flowers at night which last a single 24-hour period. Others bloom in full sun. The most prized flowering plants in this class are the jungle cacti. These plants are native to shaded tropical forest floors and, therefore, do not fair well under intense light. Flowers are initiated when the day length becomes short as would occur in early winter and spring. The famous Thanksgiving and Christmas cacti are two such plants which respond to short days. These plants should be placed in a window which receives indirect light. They do best when they become pot-bound and the soil moisture is evenly maintained. Changing conditions in the middle of the flower response will surely result in bud drop, a condition which plagues many indoor gardeners.